If you’re born with the last name, Legend, you know that you’re destined for major success. Luckily for John Legend, this is exactly the case. Other than being a really talented musician, a loving family man and an all-round great guy, Legend has now achieved EGOT status. If that wasn’t enough, he is also the first black male and the youngest person to ever achieve this, so getting this award was like a triple whammy of success. Fans, family and friends are so proud of Legend for achieving this, with many taking to Twitter to congratulate him on his success. Even his wife, Chrissy Teigen, posted a picture of the three EGOT winners on the night (which included Andrew Lloyd Webber and Tim Rice), titling the photo, ‘EGOT GOATS.’ The trio each rounded out their awards shelf with their phenomenal work for the TV presentation of Jesus Christ: Superstar where John Legend played Jesus Christ (Superstar). 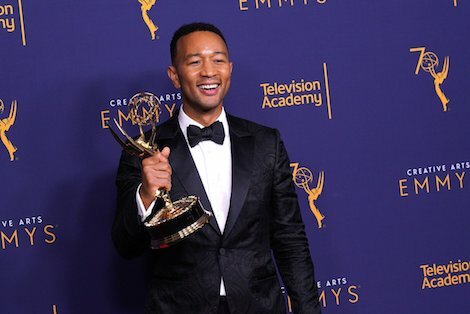 BIG CONGRATS TO JOHN LEGEND BECOMING THE FIRST BLACK MAN TO COMPLETE THE EGOT! SO PROUD AND HAPPY FOR YOU MAN ?? Honestly, if we are ever half as talented as John Legend is, we would feel like a success. Pushing the boat out a little further, if we ever got awarded the EGOT award, we hope that we could get a big necklace, a la 30 Rock’s Tracy Jordan, just show off how amazing we are. Perhaps a Christmas gift for John? Are you proud of John Legend for getting this prestigious award? Do you know of any celebrities who are close to achieving the EGOT status? Let us know in the comments, or on Twitter at @WhatsTrending.